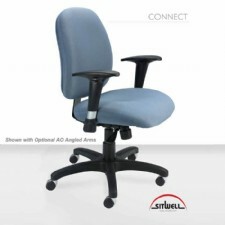 Sitwell Connect Standard Size Swivel Tilt Task Chair. Standard seat wrapped with 3/4” memory foam. Ratchet back height adjustment . Multiple arm options available (Priced here with A-arms (Adjustable height/width). Standard black poly baseTwo paddle tilt lock . Swivels 360 degrees. Seat and back tilt as unit. Upright position tilt lock. Gas cylinder seat height adjustment. Tilt Tension Control. Priced with Grade 1 Fabrics . Other Fabric Grades available as well as Customers Own Fabric for higher price. Sitwell's standard task chair series for everyday use, backed by a lifetime warranty. The Connect Series is one of the most customizeable series in the entire Sitwell line. 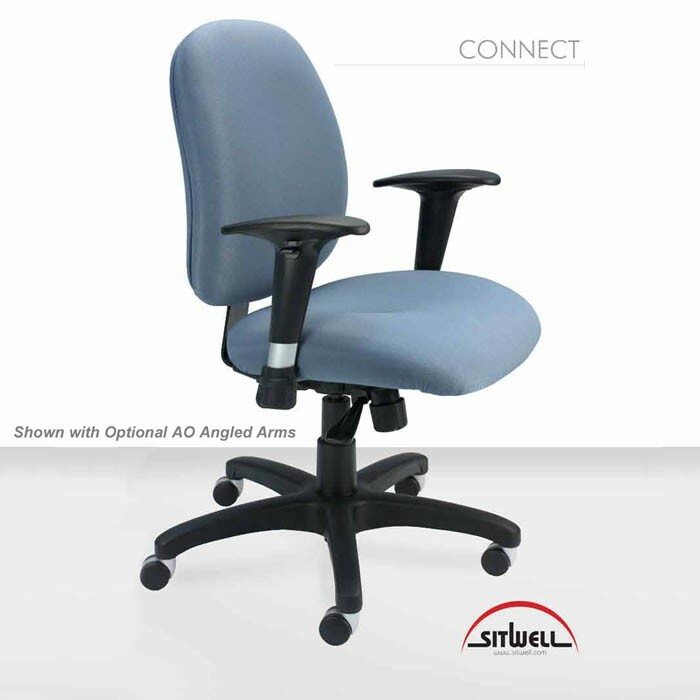 Connect - SitWell’s most versatile office seating line. ¾” Memory Foam wrapped multi-density foam make this the most comfortable chair in its price range. Also included, is a waterfall seat front, the best choice for your circulation over long periods of time. Options, options, options…your choice of 3 arm pads, chrome and brushed aluminum bases, different cylinder heights, ballistic nylon backs, seat slider, and more. Backed by SitWell’s Lifetime Warranty on all components and a five year foam and fabric warranty. Please use the link below to browse available Sitwell Fabrics. Select the Grade you are searching for (i.e. Grade 1). You can then click on a fabric to see specifications and different colors.